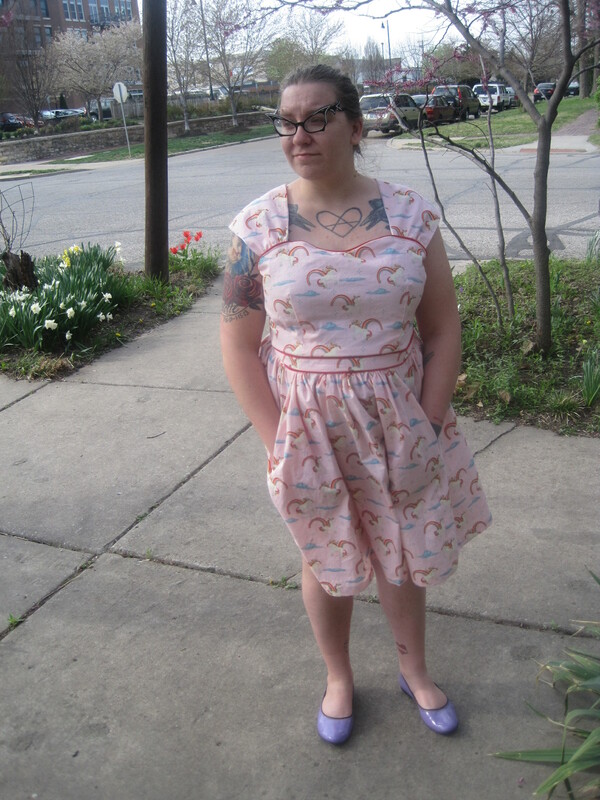 when i was first thinking about trying to sew my own dresses (three months ago), the cambie dress by sewaholic was one of the first designs that caught my eye. but it was listed as an “intermediate” pattern, & i thought i was an adventurous beginner at best. so i started with some other designs first. then i saw this new unicorns & rainbows print by doohikey designs & i knew it was destined to be a cambie. the cambie has a sweetheart neckline, little gathered cap sleeves, & either an A-line or a gathered skirt (both with pockets). 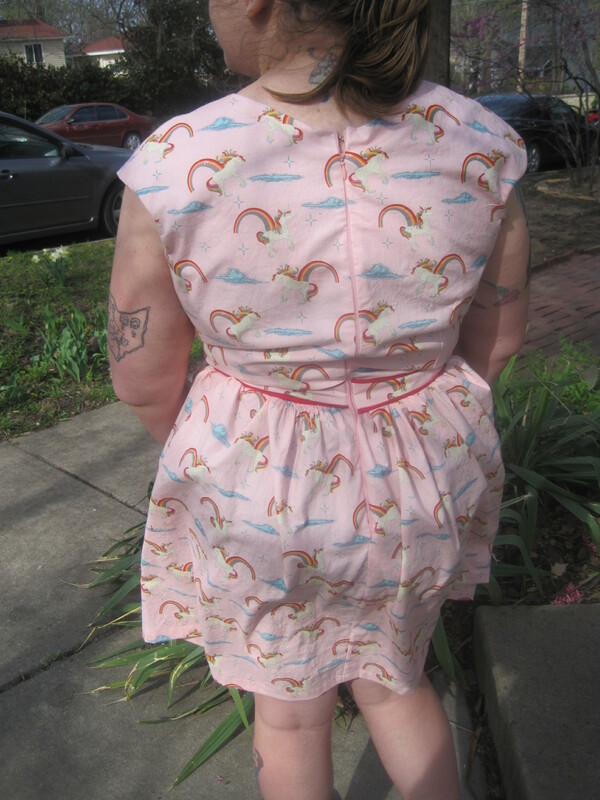 it’s a pretty frilly, feminine pattern, especially with the gathered skirt (which i knew would be my first choice for silhouette), & while a lot of other seamsters on the internet have tried to contrast the sweetness with contrasting fabric choices, i decided to go ALL IN with pink unicorns & rainbows! also of note: see my purple shoes? those are the new fluevog amies i picked up on sale. very cute & surprisingly comfortable! sewaholic designs for “pear shapes,” which is not my fit issue. as such, the largest bust/waist measurements were just a little small for me, & the hip size was much too large. i would up adding a total of two inches to the side seams, doing a 3/4″ swayback adjustment, & expanding the dart legs on the front bodice a quarter-inch on either side. i also shortened the shoulders half an inch. i probably could have lost a full inch there, but i was worried it was pulling the bodice up & making it too short in front. i left the skirt as is, since it’s gathered & didn’t really have to be a precise fit. i was worried that a gathered skirt would be way too much fabric draping over my stomach, so i chose to eliminate the skirt lining to cut down on fabric in that area. 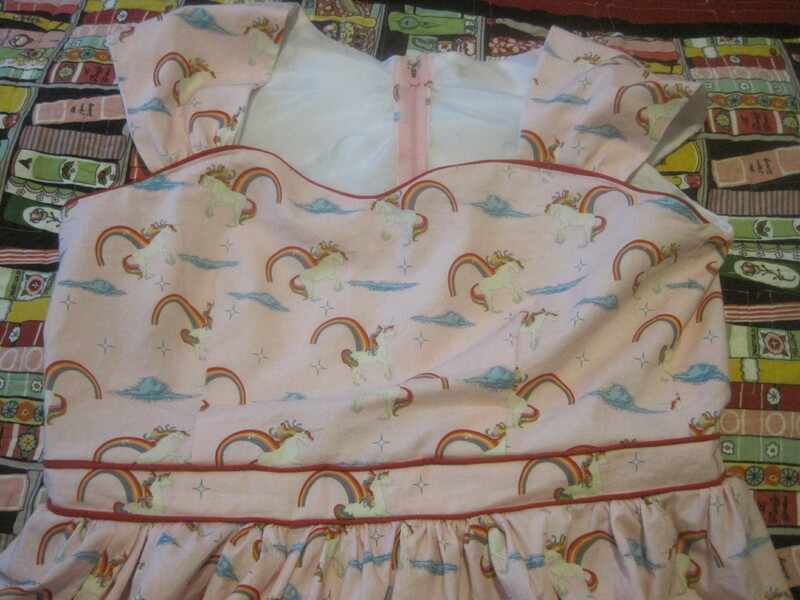 the unicorn print is a bit on the heavy side for the average quilting cotton, so i think it will be fine. & i am still planning to make a slip one of these days soon. i also added the piping to the waistband & neckline. & i made the piping! it’s not pre-bought! i had 1/16″ cording & i wrapped it in red fabric & sewed it on. it was my first time making piping & it went pretty well. it took a few tries to figure out how to pipe a sweetheart neckline (tip: you have to cut all the way up to your stitch line to get it to curve properly at the middle on the neckline), but it turned out pretty well. i also used red for the pockets, which you can’t see here because my hands are in them. i lowered the pockets a bit because i’m ridiculously short-waisted. leaving them where they were would have created abdomen pockets. since i only lined the bodice, i just kind of had to wing it on some of the dress construction. i used white bemberg rayon for lining & that stuff is so fiddly to cut. it doesn’t matter THAT much because it’s just a lining. it’s not meant to be seen. but it’s very slippery & kind of hard to sew & i was really anxious when it was time to line the sleeves because the lining was so much smaller than the fabric i’d cut for the sleeve. & i didn’t really understand how i was supposed to stitch from the inside when it was already lined. i wound up just tucking the sleeves into the pockets between the dress & the lining & stitching across the front, just under the piping. i think it looks fine. i used pink thread that matches the fabric exactly, so i doubt anyone will really notice. it’s not perfect, but it’s not bad at all for a first attempt! 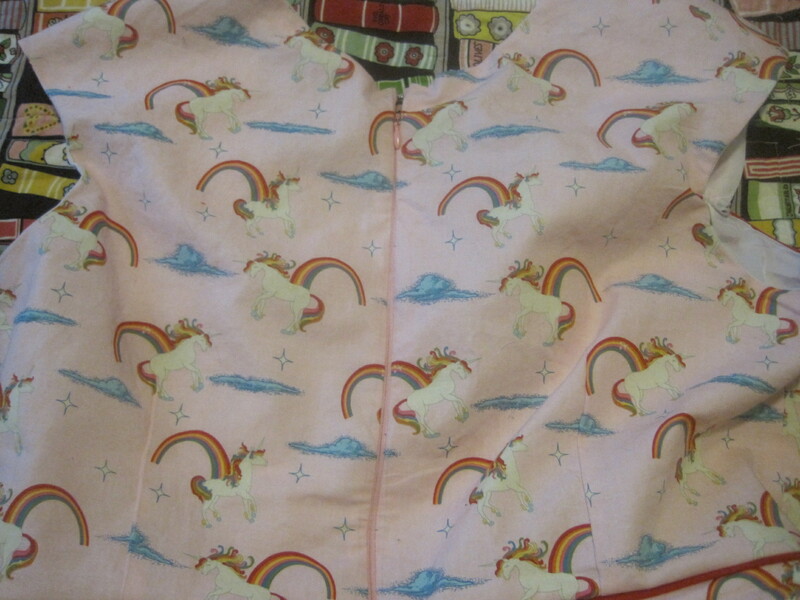 i also tried to center a row of unicorns in the waistband. * how to make a pattern (slightly) bigger. * how to make piping for both straight & curved seams. *how to gather a waist (it’s pretty much exactly like making ruffles by hand, which i’ve done several times before). * that invisible zipper can be sewn with a special invisible zipper foot. not that i did a spectacular job with it. but the zipper is slightly more invisible than it would be had i used a regular zipper foot. * using stay tape at the neckline, shoulder seams, & zipper (for added stability). * maybe only one layer of interfacing on the waistband. it’s two pieces of interfacing, two layers of fabric, plus the piping. it’s A LOT. that means it’s really sturdy & doesn’t collapse as soon as i put the dress on, but two layers of interfacing & piping as probably overkill. * i think the stay tape does help the neckline curve toward my body, but it’s possibly just a hair too big. i should have experimented with only adding an inch to the bodice (a quarter-inch on each side seam) & added more at the waist as needed. oh well. other than that, i’m really happy with it! i’m also getting better at sewing in hooks & eyes, & this was my first project since i had my pinking shears professionally sharpened. i finished all the seams by pinking them & they cut like a dream now. 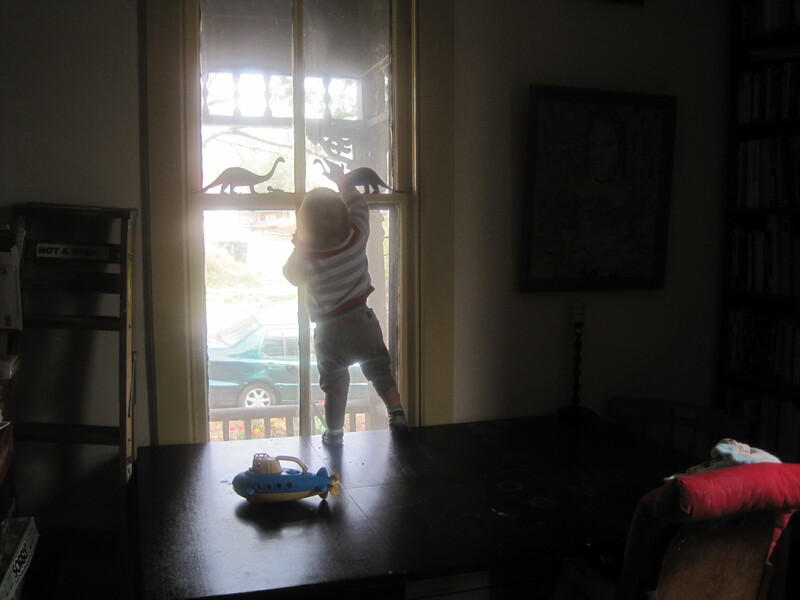 STANDING on the dining room table! what a beast. & here’s a photo of her, just for cuteness. 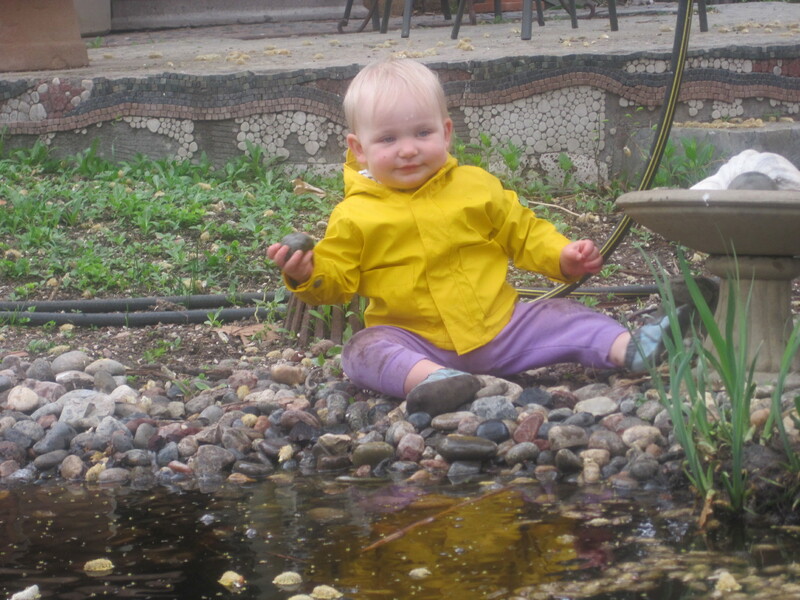 getting ready to throw a rock into the pond in the backyard. 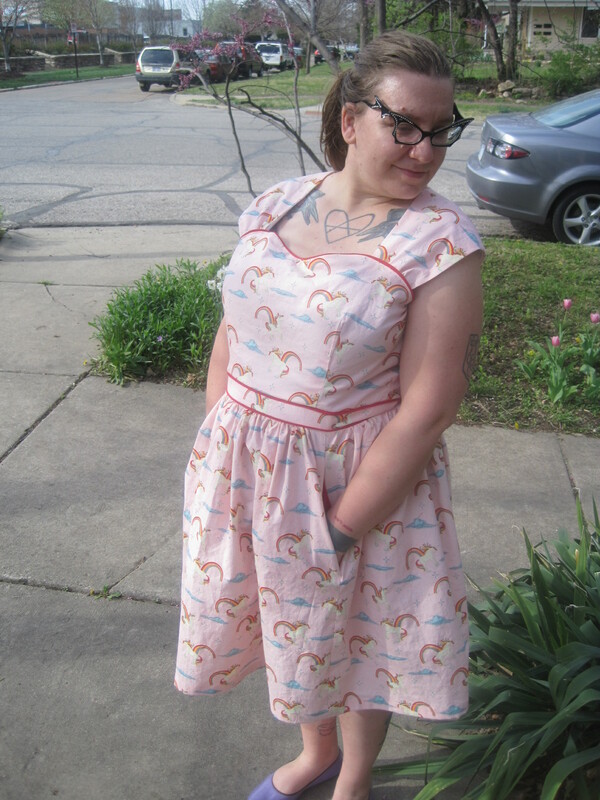 ps–i think i am going to enter this dress in the sew dolly clackett challenge. not because i expect to win anything. i mean, this is only the fourth dress i’ve ever made. but i like how it came out & i honestly have learned a lot of what i know about sewing from blogs. gertie’s new blog for better sewing was the first blog i found when i went looking for blogs on sewing, & i learned a million useful things from it. (i used her tips on stay tape in this very dress.) but her blog also intimidated me a little because there’s a lot of talk about expensive garment fabrics & i gravitate toward quilting cotton in wacky prints, as i’ve written about before. roisin’s blog was one of the first i found when i was looking for examples of how other people have sewn the cambie, & i loved that she also tends to use fun prints & quilting cottons. it helped motivate me to just go ahead & try dressmaking with the to which i am attracted. so.